W5100 is a versatile single-chip network interface chip, internal integration 10/100 Ethernet controller. Mainly used in high integration, high stability, high performance and low cost of embedded systems. W5100 internal integration of the whole hardware, and after many years of market validation of TCP/IP protocol stack, Ethernet medium transport layer () and physical layer (PHY). As many as four separate port, double row 2 * 2.0 mm 14pins.Using W5100 don't need to consider the control of Ethernet, only need for a simple port (Socket) programming. A variety of interface can choose: direct bus, indirect bus and the SPI bus. Internal integration 16 kbyte transceiver cache. Support automatic polar transformation (DMI/MDIX). 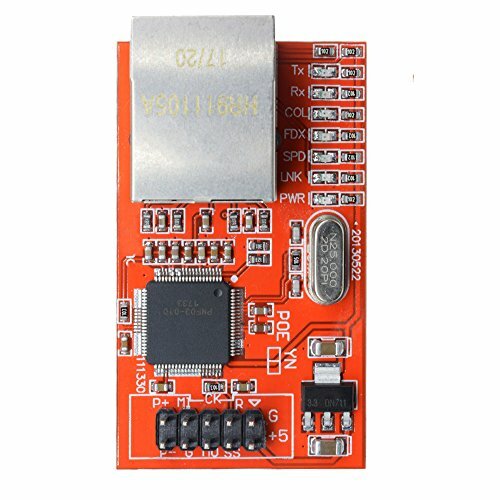 3.3 V power supply, IO is compatible with 5 V voltage signal. Using W5100 can realize no Internet connection of the operating system. W5100 with IEEE802.3 10 base-t and 802.3 u 100 base - TX compatible.